The first shot is a simple one, but already you know you’re in the hands of a master filmmaker. Jordan Peele came out of the gate with the standards raising horror film “Get Out,” and already his second film Us is more technically assured in what supports another head-spinning horror story. Peele’s the hottest talent in Hollywood now, and he makes his actors into hot properties while he’s at it. 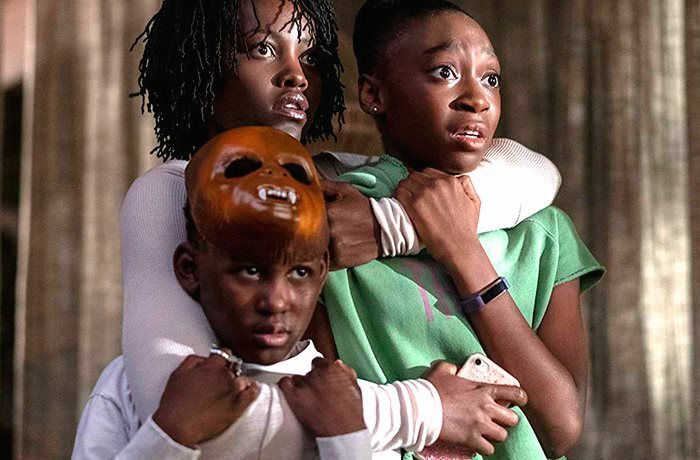 Lupita Nyong’O gives one of the great horror film performances as Adelaide, a mother of two who had post-traumatic stress disorder following an incident in a scary mirror house at a young age, and returns to the area again while on vacation, only to meet her doppelganger. Once the pressure cooker of the story takes place, Nyong’O is on fire. That’s not to say that the other actors also chip in quite effectively: Winston Duke as the jolly father Gabe, Shahadi Wright Joseph as the young withdrawn teen daughter Zora, Evan Alex as the more rascally Jason. The other family members also meet their murderous doppelgangers, feral to say the least but they are doubles. “Us” is in effect an in the moment slasher movie in which the seemingly tranquil family has to now survive non-stop attacks on their lives. Of course, there’s a lot that keeps us guessing while the violence is taking place. For awhile I thought, sure, they are doppelgangers, but where do they come from? Or perhaps these doubles are figments of their own id? Peele wants us to think beyond our first impressions, and he continuously gets us to keep thinking throughout. A phenomenon is taking place, but this is the kind of film you must listen carefully to because the clues are in the abstract and often only said once, so listen up. You might have to see “Us” twice so you can connect all the puzzle pieces. I see myself seeing “Us” twice just to parse away at the genius of Nyong’O and her extreme dialectics that she practices between two selves. Some detractors might say there are gigantic gaps in logic. During the film, I had just one: Where do these doppelgangers come up with their wardrobe? Those threads are a little too neat and pressed to have come from subterranean chambers where they reside. The ambitions of Peele are incomparably huge, though, and must be respected enough so that you can brush any such reservations aside. Peele’s direction begins in normalcy, and he specializes in dialing up the surreal slowly but surely. 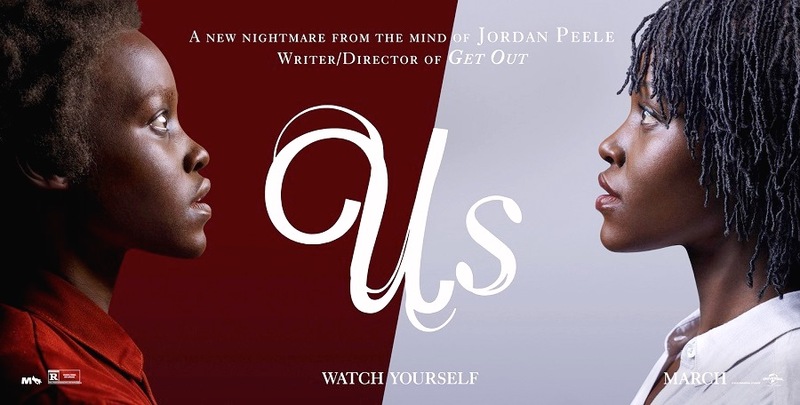 “Us” gets to a place of Caine and Abel levels of darkness, and Peele’s story logic convinces you that it plausibly got there. Yet the pieces of the puzzle, of “Us,” are of the more abstruse and mysterious kind. I love the more pointed social commentary of “Get Out,” but with “Us” you have to embrace the ambiguity of what Peele is doing this time. He’s part Lynch, part Polanski, with the occasionally camera virtuosity of DePalma. Peele is also his own man, and a few more films down the line, Peele could be a complete filmmaking language unto himself. Go to “Us” and prepared to be rattled. Film Cousins: “Eraserhead” (1977); “A Tale of Two Sisters” (2003, South Korea); “Enemy” (2013); “Get Out” (2017).